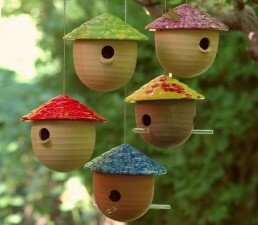 To fill these bird feeders, just slide the mushroom top up the cable and poor your seed in. We love that they have multiple openings to encourage several birds to feed at a time. 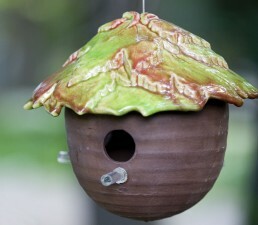 Since these feeders are made out of ceramic, plexiglass and a coated wire cable, they can withstand all weather conditions. Hand glazed, so no two are exactly the same.